On Thursday, 2 November, it’s finally showtime at the Collab/Collide Summit and there’s a great line-up of speakers and panel sessions to attract the attention of delegates on day one. If anything, there’s too much choice on offer, making it difficult to decide which session to attend or which speaker to absorb. So we’ve made it easier and published our inside tips on the day. Sleep in and you’ll miss the speech by Australian Treasurer Scott Morrison at 8:30am. Mr Morrison has been the Australian Government’s patron for our fintech industry during his entire term as Treasurer from September 2015 and unveiled a long list of fintech friendly announcements in the 2017-18 budget. 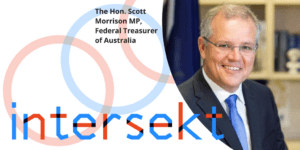 Mr Morrison will outline the government’s vision for the fintech industry and we’re also hoping he will have some announcements under his hat…let’s see how we go. At 9am, we’re expecting UK-based digital identity expert David Birch to help provide some insights into digital identity trends around the world and the best way to progress a digital identity framework in Australia. This is currently a big issue, with Australian Digital Transformation Minister Angus Taylor making strong noises about establishing a centralised Australian digital identity framework which may end up replacing our reliance on bank-by-bank passcodes. In addition, the introduction of an open banking framework – where people can easily transport their data from one provider to another – is likely to hasten the need for such a framework. Not everyone agrees a centralised ‘Australia Card’ style solution is the best way to go – so we’re hoping David can give us the insights we need here. Australia is taking a world leadership approach to encouraging improved female participation in fintech. 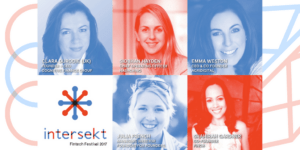 We’ve made a world-first commitment that the Intersekt Festival (of which the Collab/Collide Summit is part) will have an equal number of female and male speakers. At 9:30am, we’ve got a great Women in Fintech Panel looking at this issue. The panel is made up of Clara Durodie (Cognitive Finance Group, UK), Emma Weston (AgriDigital), Shahirah Gardner (Finch), Siobhan Hayden (HashChing) and Julia French (Founders for Founders). 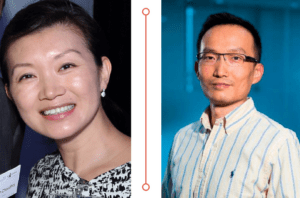 We’ve got two great Chinese venture capitalists – Nina Zhou and Steven Ji – to give us rare insights into what is the world’s number one fintech country. Read more about Nina and Steven here. Nina is first cab off the rank at 10:10am with Steven (who rarely gives interviews) talking before lunch at 12:10pm. 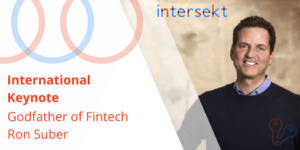 At 11am, we’ve got Ron Suber, the US-based “Godfather of Fintech” and an all-round good bloke to come to talk to us about global fintech trends. Mr Suber is world-renowned alternative financing expert. Mr Suber is known as the “godfather of fintech” due to his extensive global business network along with his commitment to help grow the fintech industry. He has personally invested in some 15 fintech companies, including multi-lender student loan marketplace loans Credible, which was founded by a US-based Australian. He previously spent five years leading the growth and transformation of Silicon Valley based lender Prosper Marketplace. At 11:30am, we’ve got a cracking international panel looking at disruption. 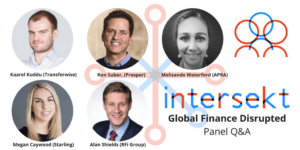 The panel is made up of Megan Caywood (Starling), Kaarel Kuddu (Transferwise), Ron Suber, (Prosper), Alan Shields (RFi Group) and Melisande Waterford (Australian Prudential Regulation Authority). For the afternoon, we’ll be splitting up into different panel sessions. 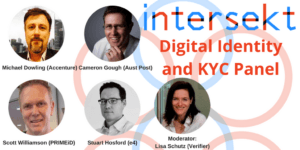 Based on the forthright opinions shown in this story by our media partner Business Insider Australia on digital identity, we’re hoping for plenty of fireworks in the session at 4:10pm on the main stage on digital identity and Know Your Customer (KYC) requirements. Lisa Schutz from regtech firm Verifier is clearly wary of a centralised solution. “Some cultures can handle more centralised control of information, but I suspect that Australians are at the other end of the spectrum,” she told Business Insider. Yet her fellow panelist Stuart Hosford would be introduced in using a centralised facial recognition technology to establish customer identity. Following this on the main stage, at 4:50pm, we have Megan Caywood, Chief Platform Officer of the UK’s Starling Bank. Megan is part of our UK invasion at the summit. Megan will be able to update the summit on her company’s innovative new marketplace product, which was only launched in September. The Starling Marketplace puts products from other fintech providers within “an easily browsed ecosystem” accessible within the Starling app. It is an interesting and collaborative model and one that we’re keen to hear more about. Then after this, you can feast on the Visa Next Money PitchFest from 7pm at the Expo area. Startups will be competing for the chance to be on stage in Hong Kong and win the title of best in show at Asia’s biggest fintech pitch fest.